US aerospace giant, Lockheed Martin, has rebutted a report, widely published in the Indian media, that it had offered India its state-of-the-art F-35 Lightning II fighter. The F-35, a fifth-generation fighter that is only now entering service in significant numbers, is vastly superior to the F-16 Block 70 fighter that Lockheed Martin is offering India in its proposed purchase of an estimated 100 single-engine fighters. But on Monday, Lockheed Martin spokesperson, Michael Friedman, stated: “The article referencing F-35 production in India was misreported and incorrect. The conversation was in regards to F-16 production”. 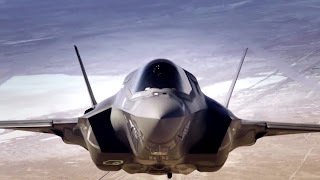 Further, Defence industry trade magazine, DefenseNews, quoted a Indian defence ministry official as stating: “There is no such plan, and no official proposal has come from US government and Lockheed Martin” to produce F-35s in India in the future. The confusion stemmed from a long-running marketing effort by Lockheed Martin to burnish the older F-16 Block 70 by suggesting that it containes many advanced technologies developed for the firm’s two most advanced fighter aircraft – the F-22 Raptor and the F-35. Vivek Lall of Lockheed Martin told PTI: “Many of the systems used on the India-specific platform (i.e. the F-16 Block 70) are derived from key lessons learned and technologies from Lockheed Martin's F-22 and the F-35, the world's only operational fifth generation fighters. Lall, like several Lockheed Martin officials who have visited India in the preceding two years, said in New Delhi on Saturday that the F-16 Block 70 had fifth-generation capabilities. He said its key sensor – an APG-83 Active Electronically Scanned Array (AESA) radar – shared a high degree of commonality with the F-22 and F-35 radars. Those who oppose buying the F-16 for the Indian Air Force (IAF) say it is not in the same technology class as the F-22 and F-35, which India has never been offered; that the F-16 Block 70 is hardly an exclusive offer to India since it is building an equally capable version for Bahrain; that the F-16 is based on a 1970s airframe, and that Pakistan has operated it for decades, learning its weaknesses and vulnerabilities. Meanwhile, American officials and analysts who favour enhancing US-India relations suggest that Washington offer India the F-35, which it is supplying at least nine other countries. Rich Verma, formerly US ambassador to India and now vice president of strategic advisory, The Asia Group, has proposed that Washington formally undertake to provide India a “qualitative military edge” (QME), as the US does with Israel. “India has already been declared a 'major defence partner' of the United States. Mandating a QME for India would open the door for supplying the F-35”, notes a top US defence industry head, based in India. Yet, supplying F-35s to India would require a special effort by Washington. The IAF wants to rapidly induct fighters to replace 10 squadrons (about 200 aircraft) of MiG-21 and MiG-27s that are already overdue to retire, but the F-35 production line is already committed to building 3,000 fighters, including 600 for foreign customers, according to Lockheed Martin. With the F-35 line at Fort Worth, Texas, currently building 66 fighters per year, and due to reach its full annual rate of 166 fighters only in 2023, it already has orders for two decades worth of production. “Does Washington have the political will to squeeze out 100 F-35s for India from a fully committed line?” asks a recently-retired IAF air marshal. The F-35’s affordability would be important for New Delhi. India is paying $115 million as the bare-bones cost of each Rafale fighter (with India-specific enhancements, spares, logistics and weapons all extra). In comparison, an F-35A (the air force version) cost just $94.6 million in February 2017, said Lockheed Martin. This is slated to become even cheaper. “As production ramps [up] and additional improvements are implemented, Lockheed Martin’s goal is to reduce the cost of an F-35A to $80 million by 2020”, announced the company in November. More than 265 operational F-35s have already been delivered to the US Air Force and eight other nations including Australia, Italy, Israel, Japan, Netherlands, Norway and United Kingdom. Going for the F-35 would be a no brainer. Far far better deal than the very expensive French stuff. It would really give IAF the edge. It would probably make Modiji grow a pair to do actual SUR-JI-KAL strikes, instead of the bollywood action sequences. On another note, sad to see COAS being dragged into politics. I wish the army stays out of the political arena otherwise its only a downhill path. Look at our politicians. A sensible and honest account at last, long after the last one from Arunachal. You do have an honest bone somewhere Col Tag Heuer. Stay true. F35 is not ready yet. It has lot of unresolved technical problems. Also 3500 f35's are on order already by lot of nations, so if India orders now it will only get it after completing delivery to all the other nations. There will be no TOT. At war time USA may stop supplying spares to India, not a believable ally. F35's operating cost is 35000$ per hour. Additionally maintenance cost will be there. India may only get a watered down variant of f35. I do not know when we will stop dreaming. We need to get our own arms before before talking very big. Let us induct LCA and Arjun in big numbers. While LCA should be inducted not just in Mk1 but also navy version. The navy should use it out of their shore based air bases. Once inducted arm them with shipping missiles . They will do a good job on Gujrat, Tamil Nadu/kerala coasts and to some extent on A& N Islands. These planes can be upgraded once upgrades are available, this is routinely done by US and Europe. Only india we have big phase I/IOC 1, IOC 1.5 then 1.785 eyx. If the balloon goes you can always move a couple of them to the north to augument IAF. Instead of buying new T-90, move T-90 to leh, Sikkim/northern sector. Replce them by Arjuns in the west. If we do not build big numbers of local arms, spares will always be an issue. The we get enough experience to carry upgrades and develop newer products too. I do,hope MoD and Armed forces understand this. IAF needs F35 as AMCA and FGFA are not going to come before 2030 (going by LCA example). F35 has stealth which FGFA may not be able to match and has exceptional radars. doesnt matter if there is no TOT we can reverse engineer if we want to. but for all this IAF bosses must show spine and vision as to what they want? ?